It’s been over a year now since we got 5 Serta air mattresses that we suspected could be the “suspects” to be the best airbeds by the brand. The Serta EZ turned out to be the best airbed by Serta in 6 out of 7 updates we did for this guide. It’s currently rated at 82 / 100. Here, we present our most recent findings – the quality ratings, the reviews that our testers and users shared with us and our conclusions. 11 What’s the bottom line? As we can see, there are a number of changes in, well, numbers, and we’ll go over them as we start with specific digest reviews. Nothing different in the overall positioning, we’re afraid, but if you think this update will be boring, you have another thing coming. Let’s first take a moment to see all of our today’s winners “duking it out”. Height 22 " 18 " 15 "
This is a premium Serta NeverFlat air mattress. The NeverFlat refers to the pump which is designed to add air during the night and keep the mattress inflated. In other words – no more air leaks and waking up on a deflated bed. We’re used to these kinds of specifications from Serta. They have a good product, and they know it, so a little boasting is perfectly fine. After all, the stylish design and the solid craftsmanship qualified this Serta to be one of the TOP 3 best airbeds for guests. Surprisingly enough, the construction feels very sturdy and durable. If we’re honest, I thought we’ll get a wobbly pile of wires and PVC, but I know to admit when I’m wrong. We’ve been using it for 5 months now as our main bed, and it felt like just that. A REAL bed! 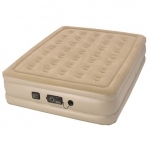 As a prevailing number of buyers already stated, this air mattress features a bed frame! It does look a bit flimsy on the pictures online, but it is anything but. Comfort and durability got a score of 84 and 81/100 respectively, which means it provides the feeling and stability of an actual old-school bed. That also means it performed like a champ during our pressure and tensile tests, which solidified it at the 1st place of our list of winners. This EZ bed is very similar to the Insta EZ, both in style and in ratings. 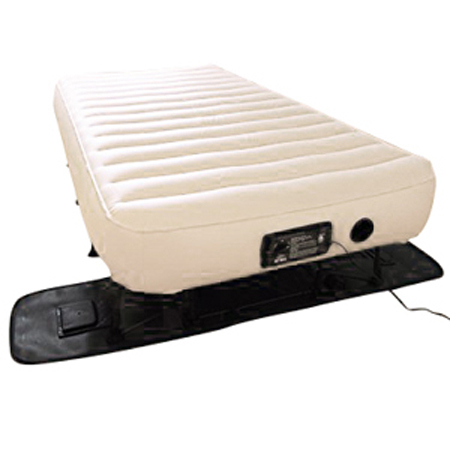 Two separate built-in pumps are also a welcome addition since they ensure your inflatable bed stays “NeverFlat”. The primary pump is somewhat loud, but that’s to be expected. The important thing is that the NeverFlat one doesn’t even make a sound when it activates, so it won’t wake you up if your mattress needs a bit topping off in the middle of the night. The construction is very solid, as proved by our tensile test. We’ve also tested the thickness of the vinyl and were pleasantly surprised. You’ll see the results in our follow-up article, but let’s just say it’ll take one hell of a persistent cat to pierce this bad boy. Air retention is the main zinger here, however. The NeverFlat pump is a true revelation, and it will keep your favorite firmness setting at all times, even if you’re a fan of “crazy-firm” mode like me. It got 85/100 in our testing, which is a result that speaks for itself. So, when it comes to whether or not you should make this portable bed a permanent part of your household, 3Beds team has no other choice but to tell you to go for it. It won’t disappoint if our numerous tests and buyers all around the world have something to say about it. For more info, you can see the full review of the Serta EZ here. Now that we have a basic understanding of this model, we can hear what the customers had to say after using the Serta Raised Never Flat in real-life situations. The size is just as stated on the chart that was offered, and it sleeps great! The NeverFlat pump is such a breakthrough! I’ve been sleeping on air mattresses for the better part of my life, and this is officially the first one that loses air absolutely NEVER! The price tag looks like a joke compared to the comfort this little guy gave us. My wife and I used it for two weeks while our bedroom was remodeled, and we honestly didn’t feel the difference between our (obviously) overpaid main bed and this inflatable one. Now we use it as a guest bed since it’s so easy to set up and store away. Plus, we don’t even need to have a dedicated guest room anymore. Guess who got his old office back! I don’t even hear the NeverFlat pump, so I can’t really tell if it ever activated or not. All I know is that the mattress remains firm ever since the moment I inflated it for the first time. I’ll just add that I like my sleeping surface uber firm, and this Serta didn’t get all flimsy on me yet. So far, so good! It’s a cool inflatable bed, but heavy as hell. I don’t know why I thought they’re supposed to be super light or something. Bottom line, there’s no way I can carry this thing on my back when I decide to hit the grand outdoors. It’s going by car or bust! This line of Serta air mattresses features much more innovations and impressive technologies than the price tag let’s on. The main selling point is the fact that you’ll never wake up on the floor due to NeverFlat secondary pump. It’s completely silent, as our tests proved, and keeps your desired firmness setting at all times. The main pump has a convenient auto shut-off feature, which lets you avoid the hassle of aiming the right time to turn the pump off. Not to give anything away since our test results article is yet to be published, but this model got a significant bump in the comfort category. It got up to 80/100, and that’s all you’ll get before the said article is live. People are starting to buy this model more and more, hence the comfort score upgrade. Our test results complement the user reviews rather nicely, so the 3Beds team has to recommend this model as one of the top-rated quality air mattresses currently on the market. The preface of the specification for this model says that Serta is the home of the best air mattresses in the world. Let’s see if that bold statement holds water when it comes to this specific Serta NeverFlat air mattress. It was straight as an arrow from the moment we first inflated it. We’ve had all sorts of troubles with some cheap Intex air mattresses we had in the past, one of them being the uneven bottom. We constantly had this feeling we were sleeping on a small boat, constantly rocking back and forth as we moved. None of that here! As I said, straight as an arrow! The overall comfort and the extra powerful built-in pump are the two most prominent features of this Serta air mattress. It got 78/100 in the comfort category and 76/100 as far as the pump quality and power are concerned. Still, it’s ways away from beating the top 2 Serta models. Other than this, it features the same goodies as the top 2 models, but considering the price, some corners had to be cut and it seems that the quality of the internal structure suffered, we have no other explanation for the reported air leaks and (again, compared to the EZ and Serta Raised) and what you might call poor weight distribution. If we compare the price tags of Serta EZ Bed and this model, we’re getting a pretty good picture of what I’m talking about. Regardless, Serta Raised with Insta III pump solid deal for the money required, and that’s what leaves us feeling good about our purchase at the end of the day. There were no fireworks this time when it comes to placement changes, but we definitely introduced a bunch of new data into the mix. This amount will only increase as the test results article goes live. We believe there’s enough food for thought to last us until the next update. The Serta EZ seems to be here to stay, however…and by here, we mean being the top Serta air mattress. Serta is an old mattress-producing company. They’ve opened their doors back in the 30s and started making air mattresses quite recently. They’ve learned quickly, and the fast success they’ve achieved has to be taken into consideration when writing Serta air mattress reviews. Enjoy reading the latest update, stay on a lookout for the follow-up guide and we’ll catch you back here in exactly two months time.